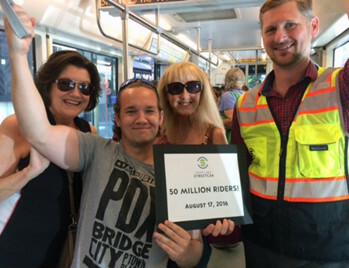 Portland Streetcar Executive Director Dan Bower celebrated the milestone on August 17th by thanking riders in person and handing out treats on one lucky car. When the streetcar opened in 2001, it served about 4,000 riders per day—a number that has steadily increased as the system has expanded and new homes and businesses have opened around it. Riders most frequently use the streetcar to get to work, and less than 5 percent of riders are tourists. Over 23 million square feet of real estate has been built along the streetcar alignment, including 17,900 residential units, including 2,911 affordable housing units. An affordable travel option at $2, Portland Streetcar’s fare is among the lowest fares of modern streetcar systems around the country. In the coming months, Streetcar riders will see more system improvements and enhanced service. In partnership with TriMet and C-TRAN, Portland Streetcar is preparing for the 2017 launch of Hop Fastpass™, an electronic fare system that will make paying for transit fast and easy. Streetcar is also pursuing plans to add additional streetcars to the fleet, making service more frequent during peak periods. About the Portland Streetcar. As the first modern streetcar system to be built in the United States, the Portland Streetcar serves 15,000 riders each day on the A/B Loops and the North/South (NS) Line. Ridership is expected to grow to 20,000 riders per day by 2025.